Here are some tips to get your spare room ready to receive friends and family. We've all experienced a fitful sleep on an inflatable mattress at a well-meaning relative's house. Many of us have even been the host in this situation. Chances are, if you don't want to spend the night in a room, your guests won't want to either. Whether you have out-of-town guests in for a long visit or friends crashing after a dinner party gone wild, a thoughtful, comfortable room will always be appreciated. Big or small, what matters is that your guest room is warm and inviting. Here are some tips to get your spare room ready to receive friends and family. You don't need to go out and buy a matching set to furnish a guest room. In fact, I would avoid this in any room. Mix and matching pieces you already have with new finds is a great way to get a comfortable room that looks well thought out. A large bed is great but if your space is limited, a single bed will do the trick. A nightstand is really important. Giving your guests a place to put their phone, books, eyeglasses and drinks is essential. Equally important is task lighting. Having a lamp on your nightstand allows your guest to read in bed and avoids them having to fumble in the dark if they wake up in the night. Your nightstand doesn't need to be big; just functional. If your nightstand is small, consider a wall mounted light. The last important piece of furniture is a chest of drawers. Think outside the box. This piece doesn't have to be a conventional dresser. It is unlikely that your guests will need many drawers so you can get creative. If space is limited you can try wall mounted drawers, this keeps the floor free and makes the room feel bigger. Linens aren't just about sleep, they're also a great way to infuse style into your room. Try to avoid using old sheets that have been around for years and opt for some new, crisp white ones. They don't need to be expensive, just new. 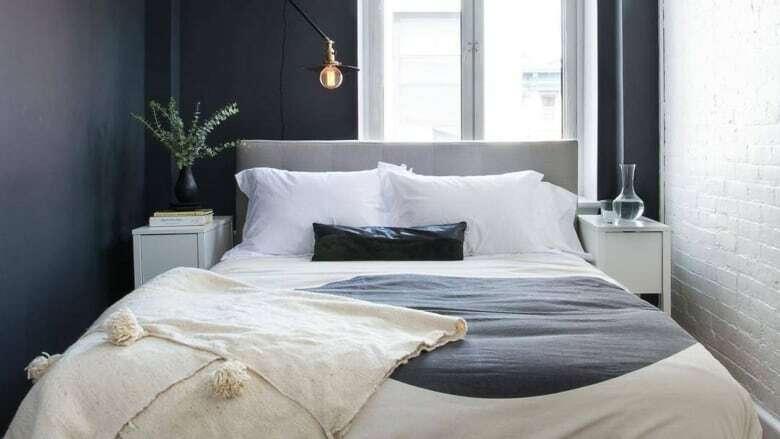 Investing in a duvet and duvet cover, which can easily be washed, is a more convenient option than a comforter, and it gives your bed a high-end, hotel-like feel. Extra pillows, preferably with shams or cases that can be washed, and extra blankets also go a long way to creating a beautiful look. Dressing your windows with nice curtains and a good blackout shade is great for both style and function. From a design perspective, curtains complete a room but, more importantly, your guest will appreciate the option to sleep in past sunrise. Overall, try to have fun with the design. Maybe try a bold colour or a wallpaper you have been hesitant to try in your own bedroom. If you're unsure of the look you want to achieve, remember that any guest will appreciate a neutral, relaxing pallet. Sabrina Spezio is a Montreal-based interior designer. Find her on Instagram @sabrinaspeziodesign.